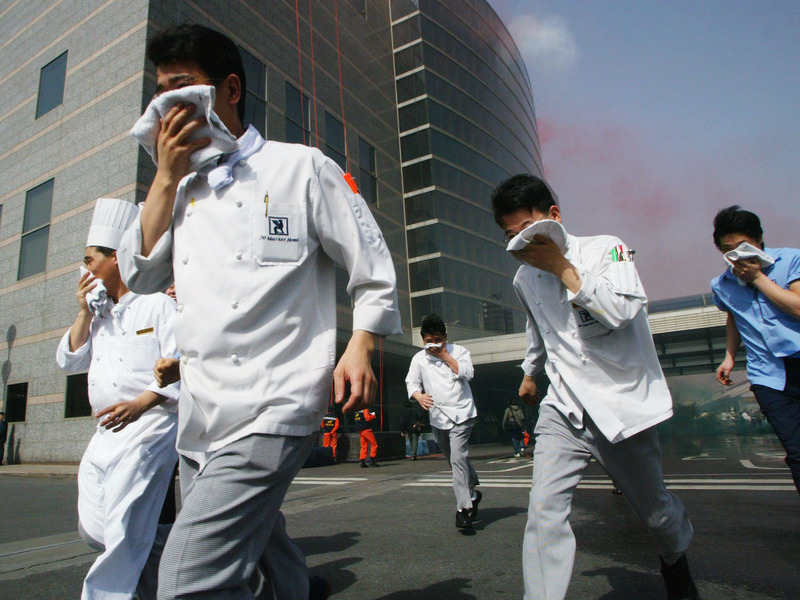 Chung Sung-Jun/Getty ImagesSouth Koreans rush out into the street during an anti-chemical, biochemical and radiological terror exercise against a possible terrorist attack. North Korea’s successful launch of an intercontinental ballistic missile on July 4 heightened global fears about the deadly threat of nuclear war. But nuclear weapons are not the only weapons of mass destruction that experts think North Korea is developing. They warn that the secretive state also possesses chemical weapon stores and may maintain an ongoing biological weapons program as well. Biological weapons are particularly scary, since they could ignite a global disease pandemic as devastating as nuclear war — a threat Bill Gates wrote about in an op-ed for Business Insider in February. The status and capabilities of North Korea’s biological weapons program are mysterious, Sonia Ben Ouagrham-Gormley, an associate professor at George Mason University and the author of “Barriers to Bioweapons“, wrote in a recent analysis for the Bulletin of the Atomic Scientists. It’s likely that North Korea has been developing such weapons since the 1960s, according to most experts. Defectors and South Korean reports have suggested that North Korean researchers have worked with biological agents the US governments considers serious threats, including plague, anthrax, viral hemorrhagic fevers, and potentially smallpox. An attack that uses such agents could be particularly scary since it can be difficult to ascertain where they came from. “With biological weapons, especially, there’s an opportunity for covert attack with deniability, since attribution would be difficult,” Andrew C. Weber, former assistant secretary of defence for nuclear, chemical and biological weapons defence programs, recently told the Washington Post while discussing North Korea’s bioweapon capabilities. It’s impossible to know how far along North Korea is in developing bioweapons, Ouagrham-Gormley wrote. Kim Jong Un visited Pyongyang’s Bio-technical Institute in 2015, where he was photographed by North Korean television posing with lab equipment and military personnel. This effort was likely “designed to send a message to the United States: that North Korea has an active bioweapons program,” Ouagrham-Gormley wrote. South Korean news reports have also indicated that North Korea is “likely capable” or “suspected” of being able to produce biological weapons. Still, other experts caution that the risk of these weapons is real and that such programs could be well-concealed. That report identifies a number of different institutions as potentially linked to a biowarfare program. Bruce Bennet of the global policy think tank the RAND Corporation echoed a similar sentiment when he testified about North Korea before Congress in 2013. In 2015, a North Korean scientist defected to Finland with what he said was electronic documentation that showed North Korea had tested biological and chemical weapons on citizens. He’s not the only defector to make such allegations, though none of those claims have been confirmed. The most recent event to spur speculation about North Korea’s bioweapons capabilities was the assassination of Kim Jong Nam, the half-brother of Kim Jong Un, which used the chemical weapon VX. Though VX is chemical, not biological, experts suggested that the event proved North Korea is willing to use these types of weapons. Kim’s 2015 photo-op demonstrated that at the very least, North Korea has equipment that would allow scientists there to work with biological weapons. But Ouagrham-Gormley cautioned against assuming too much based on those images: “When threat assessments are made solely on the basis of the equipment to which nations have gained access, grossly exaggerated evaluations of capabilities are possible — just witness Libya and Iraq’s nuclear and biological weapons programs,” she wrote. In other words, it’s possible that North Korea’s photo ops with lab equipment are choreographed in the same way as the TV reports we see of smiling people, missiles paraded through Pyongyang, and malls filled with products that aren’t actually for sale. Plus, developing a bioweapons program requires a tradition of scientific expertise, with knowledge passed on within institutions and junior scientists free to question, criticise, and collaborate with those in charge of such a program. It’s hard to create that atmosphere in an autocratic setting, according to Ouagrham-Gormley. The absence of a scientific tradition is largely why the Iraqi biowarfare program under Saddam Hussein was less far along than we expected. Economic stability is also needed to ensure that the power stays on in labs and that there are adequate security precautions in place to protect facilities packed with deadly, contagious, and fragile microorganisms. From what we know about North Korea’s medical sector, the country would likely struggle to safely store and weaponize these sorts of pathogens. “It is quite possible that North Korea has engaged in exploratory bioweapons research, but it is unlikely that the country has been able to establish the conditions required to achieve a working bioweapon,” Ouagrham-Gormley wrote. If facilities aren’t properly powered and secured, any sort of failure could result in the loss or accidental release of a deadly pathogen. “[The Korean People’s Army] must calculate that biological warfare is potentially a greater threat to the KPA than to South Korea or the United States due to its limited medical and bio-medical capabilities,” Bermudez wrote in his report.